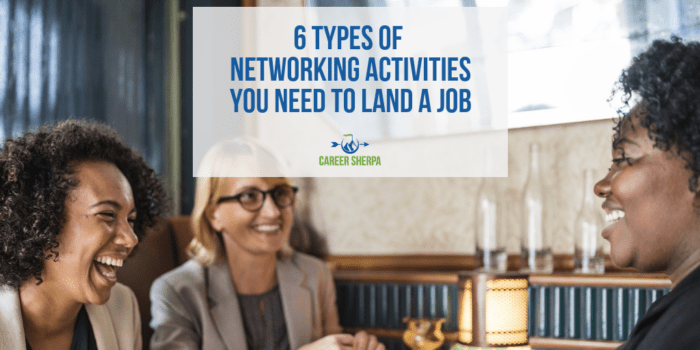 Try these six types of networking activities to help secure interviews and land new job more quickly! The best way to tap into the hidden job market, reduce your perceived risk as a candidate and increase the chance of getting an interview is by having conversations with people (aka networking). Most people I talk to, especially introverts, are uncomfortable with the idea of networking. They say they don’t know a lot of people or don’t like cold calling. I get it. I’m an introvert too! I have deep relationships with fewer people, hate going to networking events and don’t reach out to strangers. But, this doesn’t mean I don’t network. I’ve found a way to adapt and engage in networking activities without feeling yucky. What I know is that people buy stuff from people (or companies) they know, like and trust. And getting hired is kind of like a purchase – the company is purchasing you. So one of the best ways to land a new job is by getting people to know, like and trust you. You can do that by meeting people who work inside companies where there may be job opportunities (some that may have not been advertised yet)! From an employer’s perspective, identifying a candidate for a job is only one piece of the puzzle. The hiring manager needs someone who will do the job well and complement the existing team members which can be difficult to evaluate during the interview process. A referred candidate is a safer investment. So more companies have begun using Employee Referral Programs (ERP) to help fill openings. You can learn more about ERP hiring here. Data from EY has shown that referred candidates tend to make better hires, meaning they stay in the job longer and come up to speed faster. This is one more reason for you to meet people who work inside companies you are interested in. Your purpose for networking is to gather advice, information and recommendations to help you make an informed career move. That’s all. You are not asking for a job…yet. During your conversations, be prepared to share information about yourself to gain recognition as a valuable resource. Make sure you are prepared with a short pitch to answer the question about what you do. Most importantly, your networking efforts require focus and a strategy to organize and prioritize who you will meet with. Without this focus, you could end up meeting with lots of people but not getting any relevant career information or job leads. This is when networking feels like a waste of time. Be focused and strategic! The best way to do this is to create a list of companies you are interested in and think you may like to work for. Plan to regularly attend networking events that allow you to interact with new people in your industry or occupation. There are networking events hosted by professional associations, as well as career conferences, industry trade shows, and even alumni networking events. Identify one or two events per month (if actively job searching) or one or two per year if you just want to stay active. To find events, check your newspaper for local in-person networking events. Newsletters specific to your industry or occupation will often list upcoming events. Professional associations list local and national events on their websites. And don’t forget to check with your school’s alumni office for upcoming networking events near you. General networking happens when you reach out to people you know. Because these people are already familiar with you, it is easier to reach out and re-educate them on what you are looking for and to request their advice or help. People you know are also more likely to want to help and refer you to people in their network. Consider asking your network for names of people who work at target companies and people they think you should meet. As a student, you can also network in class and around campus. Be open to meeting new people any time anywhere to learn new things. Just keep in mind your mission for networking and start every conversation off by finding a common interest with the person you are meeting. The whole purpose of social media is to connect or stay connected with people. For your job search, the professional networking site you need to devote time to is LinkedIn. Step one is to build an awesome profile. Step two is to connect with people you know! But there is also the work of staying in touch with your network. One way of doing this on LinkedIn is by regularly updating your status. Here are 10 status updates you can use! Facebook, Twitter, Pinterest, and even Instagram are all platforms where employers are looking for talent and all provide you with an opportunity to network with people you know (or would like to meet). Learn how to use social networks to network. Sometimes referred to as an informational interview, an informational meeting is a way to get a conversation with someone you’d like to meet. There are two types of people you will want to meet with for an informational meeting – company insiders and industry experts. Using your target company list, identify alumni, mutual connections, and even people you know who work for companies you are interested in. Your purpose for wanting to meet with company insiders is to learn about the company. Employees are able to provide you with the inside scoop on what it’s like to work there and will also be the first to hear about new opportunities. You also want to meet with people who can share their expertise about an industry or occupation. They may not work for a company you are interested in, but the information they share about trends in the field will be incredibly useful to you. Here’s help for conducting your informational meeting. There will be times when you discover a job posting or hear about a job and want to learn more. In this case, you are networking to acquire information about the posted job. Be clear that your purpose for reaching out is to learn more about the job and what the ideal candidate might look like. You are also interested in understanding the steps in the hiring process and any information that will help you best present your qualifications. Also be sure to ask if the company has a referral hiring program. If there is one, ask if you can use their name as a referral or if they would be willing to refer you as a candidate. Always use the two-step before you submit your online application! Networking doesn’t end after you’ve met someone once. You can’t expect they’ll remember you in a couple of weeks or months. The best long-term strategy is to nurture the relationships you’ve built. To do this, look for opportunities to keep in touch with the people you’ve met so they don’t forget about you. And keep in mind, networking is also about giving back. Look for opportunities to help people you meet with. This may be in the form of sharing an article or perhaps making introductions to people who would benefit from knowing one another. You can get more ideas here.